One of the ​NBA's all-time great centers will have his number retired in February. The ​Philadelphia 76ers announced the team will retire the late Moses Malone's No. 2 during a special halftime ceremony on Friday, Feb. 8, when the Sixers host the Denver Nuggets. For fans who may not remember Malone, he was the first player to go from high school to professional basketball, when the ABA's Utah Stars drafted him in 1974. 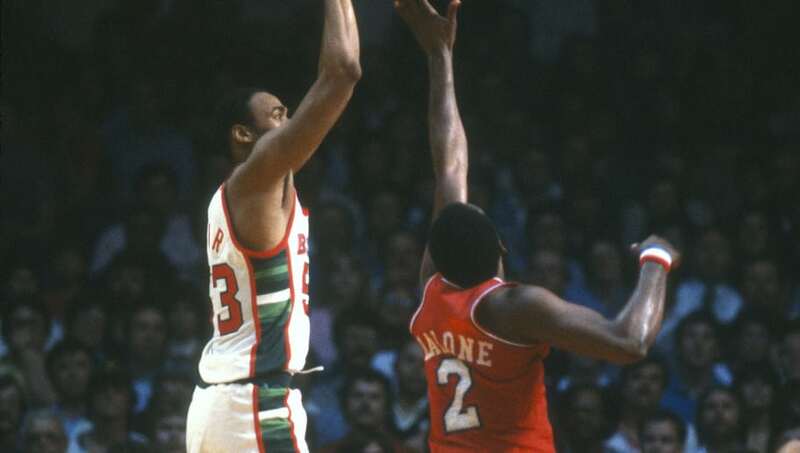 Malone was a three-time NBA MVP, 13-time All-Star (12 times in NBA, once in ABA), an NBA champion and a Finals MVP. Between the Kareem Abdul-Jabbar era and the Magic-Bird era, there was a brief Malone one where he won his three MVP awards, a world championship, and held the title as the "best player in the world." Malone led the NBA in rebounding six times, and averaged more than 20 points per game for 11 consecutive seasons. The Hall-of-Fame center averaged a double-double in points and rebounds for his career. When Malone retired in 1995, he was the NBA's third leading rebounder, fifth leading scorer, and had made more free throws than any other player in history. Malone played five seasons for the 76ers, averaging 21 points, 12 rebounds, and 1.3 blocks per game. He was an All-Star four straight seasons with Philadelphia from 1982-1986.